Comedy/Horror GARDEN PARTY MASSACRE Tags Enfant Terrible Nate Cornett as Director of Photography! Award-winning writer/director Gregory Blair's follow up film to DEADLY REVISIONS lands comic film whiz kid Nate Cornett of "Kill The Baby" fame. HOLLYWOOD, Calif. - May 26, 2015 - PRLog -- Gregory Blair and Roxy Shih, the dynamic duo of DEADLY REVISIONS (due out 9/29/15 via SGL Entertainment) are taking no chances on their second collaboration: they’ve signed on mad man Nate Cornett to shoot their wacky comedy/horror GARDEN PARTY MASSACRE. Nate has made a name for himself as one of the top go-to men for indie comedy. He’s shot content for websites such as Funny or Die, Break.com and College Humor and his work has appeared on television on IFC, MTV, PBS, and Nickelodeon. He’s known for his innovative, dynamic visuals—something that Blair and Shih are confident will be a perfect match for their madcap movie. 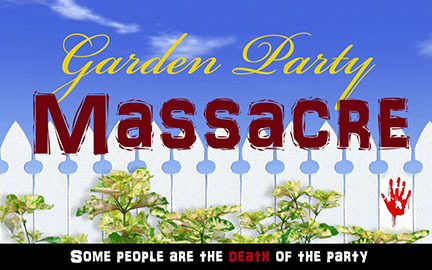 GARDEN PARTY MASSACRE is set to begin preproduction this fall through Blair’s production company, PIX/SEE Productions. With DEADLY REVISIONS garnering the Flicker award for “Best Picture”, the L.A. Movie Award for “Best Narrative Feature” as well as the Claw Award for “Best Feature Film Screenplay”, Blair has proven he knows how to tell a good tale. And GARDEN PARTY MASSACRE looks to be another winner.